Hells Canyon Wilderness packs top notch views within its small boundaries. The vertical exchange between peaks and canyons offers several opportunities for peak baggin' enthusiast. Governors Peak is an excellent choice for the northeastern wilderness. Access to the trailhead is among the easiest for this area. From the trailhead you immediately drop down into the huge wash. Which, in fact, is Castle Creek. It's interesting to imagine what type of thunderstorm it takes to fill this broad swath. If you have really good eyesight you can just make out the white login podium across the wide creek bed. If not just remember it's north of the fence by maybe a tenth of a mile. 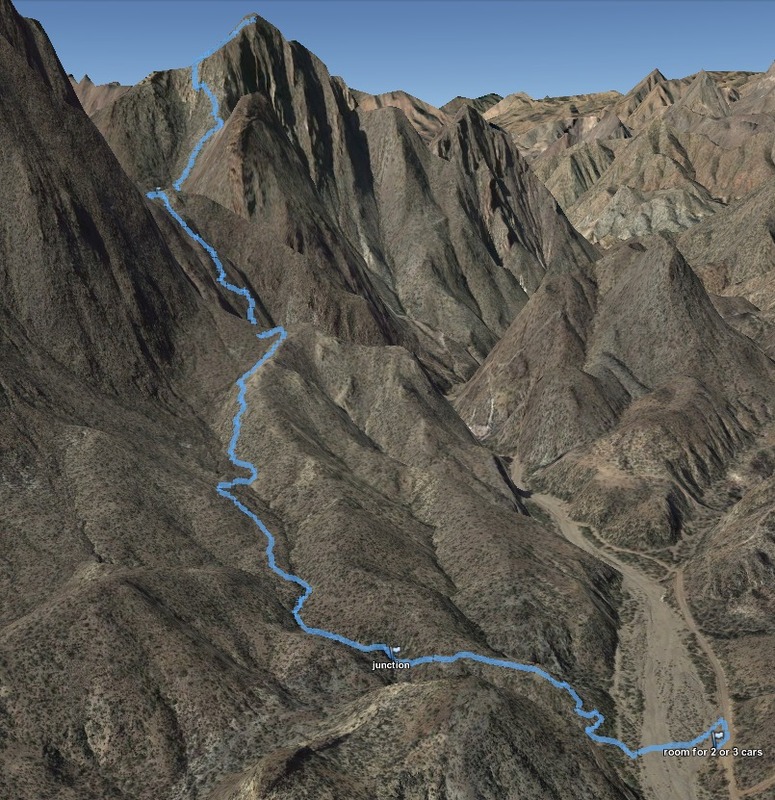 The trail starts on the north side of the low-lying mesquite filled canyon dumping into Castle Creek. The Spring Valley Trail takes off up a small rise then heads fairly flat in a west-southwestern line. It's well maintained but you will only be on this trail for a short distance. 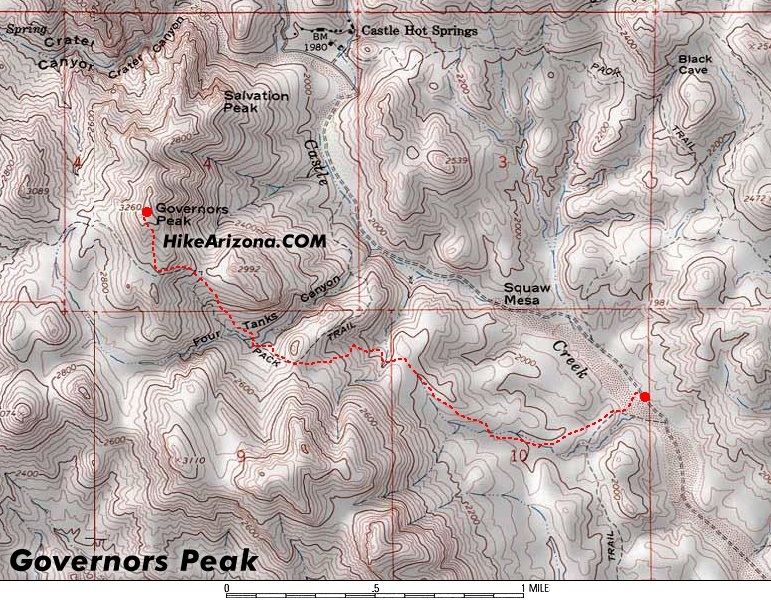 Be on the lookout for the Hermit Trail slanting out to the right. It's less noticeable and the junction is not signed. As of this writing it was cairned. If you miss the junction, the Spring Valley Trail soon dips through a wash so you shouldn't loose much time. On the Hermit Trail you appear to be headed for the steep ridge ahead. Fear not as the trail slowly curves northeast gently rising you to the first of three saddles. Prior to the first saddle be sure to peek over your shoulder and catch a view of Lake Pleasant. Up to this point I was determined to rate this trail well established and maintained. I figure the wildflower displays would be stunning in the wetter years. However with yet another dry winter behind us I wasn't surprised to find such few examples. On the return trip I noticed Arizona-wildflower-queen Christine Maxa entered the area on January 25th. I'd venture to guess she stayed on the Spring Valley Trail. Continue over the saddle. The trail drops into a tight/deep ravine and back up quickly. In fact it keeps raising a bit more to yet another saddle. This area is simply awesome. This ravine is larger and is named Four Tanks Canyon. The Hermit Trail ends at this saddle. The Bell Trail continues on. Why the change in trails? Well the Bell Trail is an older trail that used to quickly gain this ridge. Private property changed all that good stuff and the Hermit Trail was blazed to accommodate. A few steps down into Four Tanks Canyon and you'll soon realize this trail is definitely older and overgrown. If only it was that good! Upon reaching the bottom you're faced with a hearty ascent. Bad news being the trail is more or less gone. The good news being it's not much further to Governors Peak. Peak 2992 looms sharp to your right and its slopes are plastered with healthy Saguaros. It's a stunning view! With basically no trail to follow you need to study the map. The old trail is cairned but I wouldn't waist much time on the scattered mix of cairns. Here's what it boils down to. You have Peak 2992 on your right. The peak ahead of you is a false peak to Governors Peak, but it can be conquered inline if you so desire. 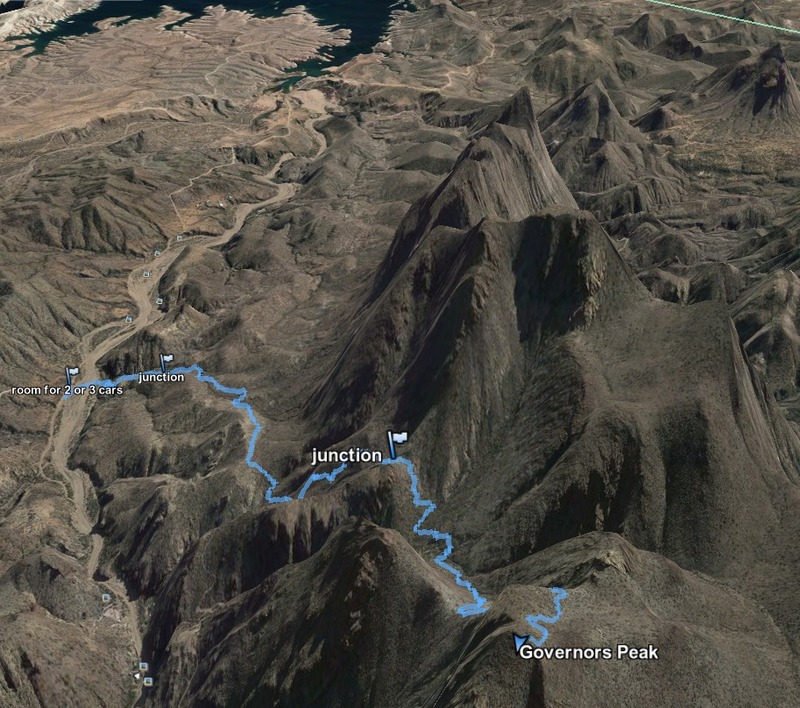 The route of choice is to gain a saddle, jag left and then ascend Governors Peak. Which is easy but you will want to watch your footing. 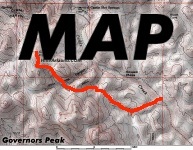 Turn right onto Castle Hot Springs Road and follow 5.2 miles to the "T" intersection. Turn left and follow 5.0 miles to pullout on left side of dirt road. It's right after a cattle guard so you can't miss it. There is an old barbed wire fence webbed with dead branches coming down through a huge wash up to the cattle guard. It seems odd parking on this mini cliff but it's correct. From your vehicle continue up the road maybe 20 yards. The trail is barely marked with a fiberglass flex-stake and goes straight DOWN! Note to cars: A car can access this area in dry road conditions. A wet road will prove difficult. Be very careful turning around on this road... the edges and beyond are extremely soft soil. Two wheel drive vehicles dig into this type of soil. Also note: if you miss the trailhead the road travels through Castle Creek in sections, this is tricky in a car if your momentum is off.